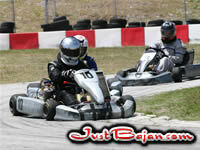 On Sunday 6th April the Barbados Karting Association Inc. completed it C.O. Williams Construction Co. sponsored raced day #3. The day had a large number of spills and thrills with exciting racing throughout the day. The qualifying was spectacular with the top 5 runners in the premier 100 cc Yamaha 310 class all qualifying within 0.382 seconds making for exciting racing throughout the day. During the days proceedings they were 28 karters completing in 5 classes with each class running 4 races. They were two major spills of the day, the first was an accident involving Christian Hinds and Alexander Gill where after several successful passes between them a daring but unsuccessful move was made which saw both karters spinning off into the grass. The second (right) was in the 310 class involving Luke St. John and Matthew Noel. One of the front runners spun on the entrance to the first corner after the straight which saw the two carts climb onto each other with Noel’s kart ending up on top of St. John. Both races were red flagged however restarted with the victims of the accidents in place and without further incident. The 310 class was dominated by Conor Roach who in the absence of Orry Hunte made light work of the field however he was beaten into second position in the final race of the day by David Evelyn. The 270 class had two winners with Christian Hinds winning 3 of his races and Alexander Gill only winning one. In the 230 class Samantha Gill made a clean sweep winning all of her races in fine from Dillon Grey. The shifter class had 3 different winners with Stuart Maloney winning 2 races, brother Mark winning one and Barry Mayers winning race 2 in fine style. The overall podium positions for the 125 cc shifters were first, Stuart Maloney (left) with 87 points, second Mark Maloney 85 points and third Barry Mayers with 71 points. In the premiers 310 class the winner with 96 points was Conner Roach, second was David Evelyn on 83 points while Nick Gill completed the top three with 71 points. The 270 class results were Christian Hinds, the winner with 96 points, second was Alexander Gill with 85 points and new comer Cole Gill third with 57 points. The 230 class had only a top two with Samantha Gill the winner with a perfect 100 points and Dillon Grey second with 84 points. The BKAI season consist of 10 races during the year with the first season about to go into its fourth race which will be on May 4th 2008 at Bushy Park, St. Phillip where entry to the facility is free and all are invited to spectate. 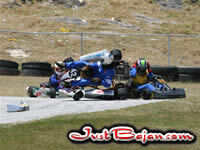 Visit www.barbadoskarting.com for more information.